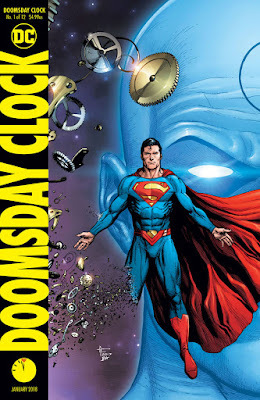 Last week at the New York Comic Con, DC Comics and writer Geoff Johns previewed the first issue of their upcoming series Doomsday Clock, a crossover between the superheroes of the DC universe and the characters from Watchmen, the graphic novel by Alan Moore and Dave Gibbons. There’s little to say about the ethics of DC’s decision to publish a Watchmen sequel—against the wishes of its writer, and against the company’s own policy of allowing the comic to stand on its own for twenty-five years—that wasn’t already said about its decision to publish Watchmen prequels under the same conditions. (For my part, David Brothers summed up the case against these comics as well as anybody, and with the perfect analogy to boot.) The people who are appalled by DC’s reduction of its most acclaimed work of art into just another content farm have already made that position perfectly clear, and the people who don’t give a damn have already demonstrated that by their actions. I doubt anybody’s changed their minds. I am, as you have probably guessed, firmly in the former camp. 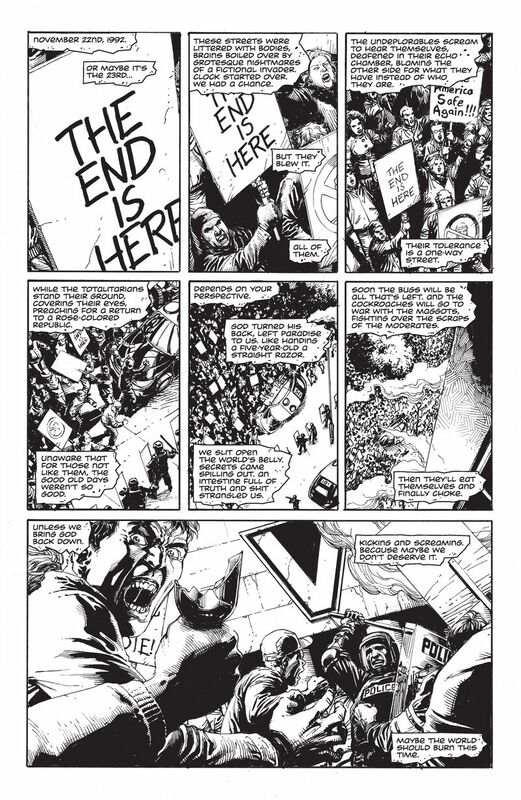 And yet as I read the previews for the first six pages of Doomsday Clock I was seized by an illicit thrill. They read like they were written for your inner sixteen-year-old (or whatever age you were when you first read Watchmen) who always wanted to know what happened next: Did Seymour pick up that journal? Did the New Frontiersman print it? Did anybody believe them? Did it all work out in the end? I mean, nothing ever ends, right? In many ways, that project would be more worthwhile than Before Watchmen, a series of answers to questions nobody ever needed to ask. 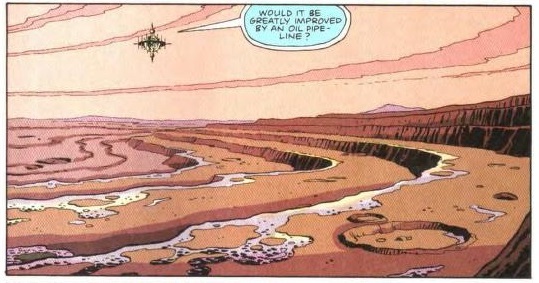 Watchmen had already charted its past with perfect mechanistic precision; it was the future that was wide open. The problem is, answering the questions everybody asked is equally superfluous in its own way. It works another kind of destruction, stripping the ending of its ambiguity and filling in blanks that had been left for each reader to fill as they saw fit. Not a transparent scam in the manner of Before Watchmen, the sequel still misses the point of the comic it claims to honor. We can see the same kind of near miss in Johns’s decision to fill the opening pages with comments on the politics of our time just as Moore and Gibbons did theirs. Again, the instincts aren’t off, and some of the jokes—a panicked US populace breaking through an ineffective wall to flee to safety in Mexico, for example—pack a nasty little sting. But Johns hamstrings whatever satiric effect he might have achieved by hedging his bets. Moore criticized left and right in Watchmen but he did so from a consistent and coherent viewpoint, a self-critical stance that never let doctrine or dogma overwhelm a basic sense of humanity. When Johns distributes his shots he reads like a man desperately afraid of alienating his audience. And so he commits the basic pundit’s error of insisting there is no problem that cannot be blamed equally on both sides. Here’s some of the opening narration, delivered from an as-yet-unnamed character’s tattered journal: “The undeplorables scream to hear themselves deafened in their echo chamber, blaming the other side for what they have instead of who they are. Their tolerance is a one-way street.” A clear reference to Hillary Clinton’s “basket of deplorables” comment, the line implies that opposition to racism and xenophobia are just as responsible for social breakdown as racism and xenophobia. The narrator goes after “the totalitarians” too, mocking their desire to return to the good old days, but he makes it clear that he holds both groups in equal contempt: “Soon the bugs will be all that’s left. And the cockroaches will go to war with the maggots, fighting over the scraps of the moderates.” That’s this comic’s assessment of politics in 2017: maggots v. cockroaches. Of course, Geoff Johns had no idea Trump was going to use those words in that context when he scripted these pages; he wrote them nine or ten months ago, which would place them after Trump’s election and either just before or just after his inauguration. But Trump’s enthusiastic support from open white supremacists was not exactly science fiction ten months ago, and we shouldn’t need the tragedy in Charlottesville to see how Johns has set up an equivocating portrayal of two groups whose views and actions are not equivalent. Of course, muddying the waters in that way is exactly what totalitarians want. It drags their opponents down to their level and makes it harder for others to tell them apart. Johns’s carefully neutral posture is anything but neutral. 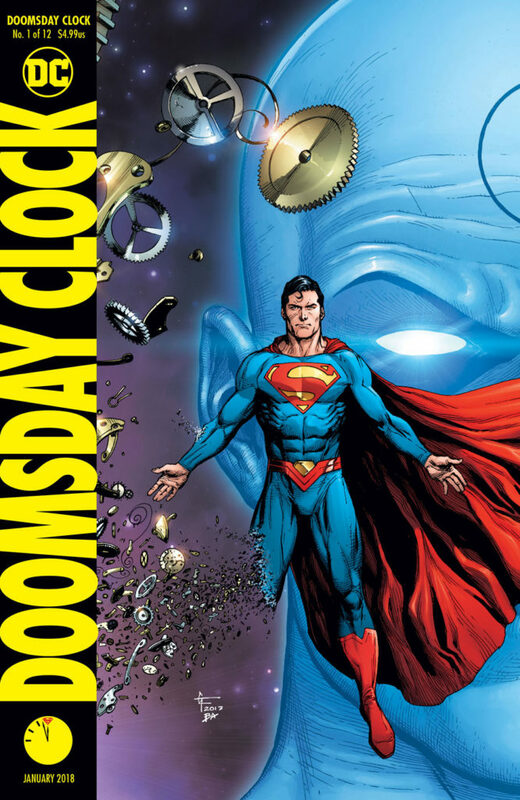 This is the fundamental problem of Doomsday Clock as we’ve seen it so far. The unfortunate coincidence of Johns’s bothsiderism and Trump’s self-serving obfuscations could be chalked up to poor timing, but the superficial fealty to Watchmen goes wrong from the start, an exercise in empty form. Johns and artist Gary Frank have lovingly replicated the fonts and panel grids of Watchmen without capturing the spirit that animated them. 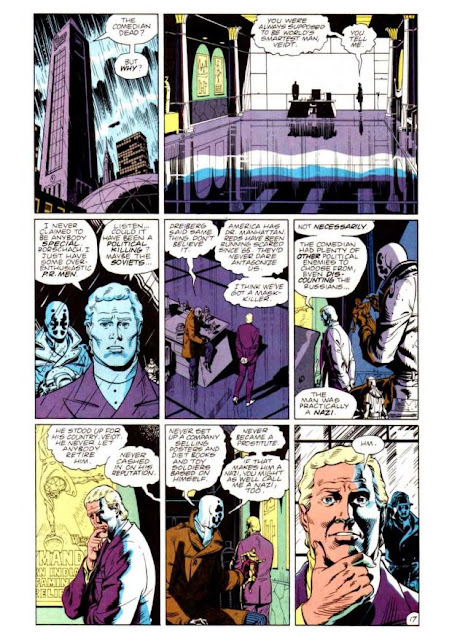 They’ve provided the crowd-pleaser of a resurrected Rorschach who doesn’t think or talk or write like Rorschach at all. As everybody who’s read Watchmen knows, neither Ozymandias nor Dr. Manhattan ever belonged to a super-hero team. None of the main characters did except for the Comedian back in the 1940s, and that didn’t end well. Those old conventions never worked out the way they did in other comics. That was the whole point. My inner sixteen-year-old didn’t know the first thing about Moore and Gibbons’s creative struggles with DC, and he probably couldn’t articulate the vague unease stirred by Johns’s false equivalencies. He could still get into the idea of a Watchmen sequel, and he’d probably think these pages were a pretty cool start. But sooner or later he would have to confront the possibility—the extremely high probability—that these will be the best six pages of the entire project. Because what’s coming next violates the premises of Watchmen, and the promise that corporate-owned comics could achieve the stature of art, more than anything we’ve seen yet. Think about it. Indulge that inner sixteen-year-old for a moment. Ask him or her: Did Seymour pick up that journal? Did anybody believe him? Did it all work out in the end? Imagine their answers to those questions. Imagine the Watchmen sequel you always wanted. And then ask yourself, to paraphrase Jon Osterman, if it would be greatly improved by the addition of Superman. Marc Singer teaches English at Howard University in Washington, DC. He is the author of Grant Morrison: Combining the Worlds of Contemporary Comics and a new book on the academic discipline of comics studies, due out next year.